Tourists thinking of going to Arizona for a tour must visit the Congress Hotel. Situated in Tucson, this hotel offers features like no other. 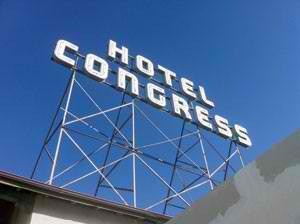 Apart from being a touristy hotel, the Congress Hotel is historic and one of Tucson’s most well-known landmarks. It was built in 1919; but soon found its fame with a bank robber by the name of John Dillinger, captured back in 1934. The Cybar club is situated to the side of the dance floor and was once more of a cyber café , about 10 years ago. The Hotel Lobby Bar is a favorite of many tourists. You’ll find many cocktails of the best kind…you can pick any of the 150 spirits that are served here. In 2010, the Hotel Lobby Bar’s bartender came out on top at a culinary competition in the World Margarita Championship with a Solerno Blood Orange culinary foam. The Congress Hotel is, also, famous for its cocktail menu and won the “best cocktail menu” in 2010.